Reliable statistics are one of the most fundamental tools for understanding New Zealand’s military contribution to the First World War. Yet widely varying figures for even the number of New Zealand servicemen are routinely quoted in newspapers, on websites, on television, in official war histories, and in politicians’ speeches. Similar confusion surrounds such basic issues as casualty numbers and even how we might define a ‘New Zealand’ soldier. This aim of this feature is to provide some reliable basic statistics and explain how we arrived at them. Public demand for reliable statistics grew during the war as people sought to quantify the country’s ‘contribution’ for administrative, educational, political or personal reasons. The Defence Department tabulated monthly returns of men entering camp, embarking for overseas, killed, wounded, and so on, and when the war ended it was able to quickly collate much of this material for publication. In February 1919 it published War, 1914–1918. New Zealand Expeditionary Force. Its provision and maintenance, a volume of 42 statistical tables outlining most aspects of military service. Here you could find out the number of reinforcements sent overseas each month, the numbers of nurses, horses, men called up under conscription, the number and type of honours awarded to New Zealanders, and much more. The department distributed Provision and maintenance to newspapers and government agencies across the country, as well as to overseas governments and organisations. This book still underpins our understanding of New Zealand’s military involvement in the First World War. Readers interpreted the 42 tables according to their backgrounds and inclinations. The 1919 New Zealand official year-book stated that by November 1918 110,368 people had been ‘provided for foreign service’, ‘more than 10% of the Dominion's mean population in 1914’, while 100,444 had been ‘attested into the New Zealand Expeditionary Force’ and ‘left for service overseas’. The Evening Post proclaimed that 124,211 men – more than half the country’s men of military age and one-ninth of the total population − had been ‘mobilised’, while 220,089 had been ‘put through the military machine’ and 135,184 had been called up under conscription. Other newspapers reported that 117,175 men had been ‘called up and sent into camp for overseas service up to the date of the armistice’, so this figure too gained some currency. What does all this mean? A sense of competition with the other dominions, and with Australia in particular, appears to have played a part in the arrangement and interpretation of figures. Different presentation of the numbers could produce wildly varying impressions of the New Zealand war effort. 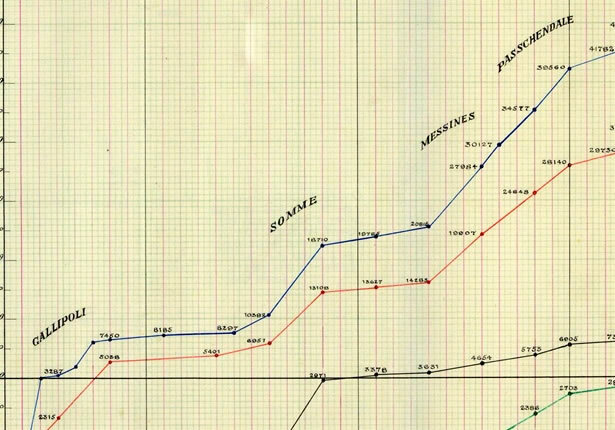 The Defence Department supplied its most inflated figure to the publishers of Statistics of the military effort of the British Empire during the Great War, 1914–20. The total number of New Zealanders who served, by that reckoning, was 128,525. Comparison with the disaggregated figures in Provision and maintenance shows that many of these individuals had been called up but failed their medical inspection, while others had undertaken Home Service in New Zealand or joined other imperial units. This exercise demonstrated the fluidity of the figures according to who was interpreting them and for what purpose. These problems of definition and categorisation, and of competing figures, are still with us. What is a ‘New Zealand serviceman’? To address this question, we must first understand and define our terms of reference. The key is to decide who should be counted as a New Zealand serviceman (or woman) and who should not. Unfortunately, the obvious criteria of New Zealand birth or origin provide no clear basis from which to work. In August 1914 the government created the New Zealand Expeditionary Force (NZEF) as the New Zealand contribution to the British forces pitted against Germany and its allies. The NZEF was a small cog in the British Empire’s overall military machine, which also included national forces supplied by Australia, Canada, South Africa and other parts of the empire. A few additional New Zealand units were formally detached from the NZEF: the force occupying Samoa, the Engineer Tunnelling Company, the Wireless Troop, and the nurses. They were, however, part of the NZEF in all but name, and this feature uses ‘NZEF’ to refer to them all collectively. The NZEF was not limited to men born in New Zealand but open to all British subjects, whichever part of the empire they hailed from. Any man of British extraction residing in New Zealand who was of military age and in good health could join the NZEF – and likewise, any New Zealand-born man residing in Britain, another dominion such as Australia or Canada, or a British Crown colony, protectorate or territory could join a local force. So the idea of ‘national’ expeditionary forces was purely administrative; they were funded and organised by the dominions as a contribution to the greater, British and imperial, whole, and were inseparable from and more or less interchangeable with their counterparts. The number of NZEF soldiers born outside New Zealand demonstrates the extent to which it was as much an imperial as a ‘New Zealand’ force. Over a quarter of the Main Body, the largest group of soldiers to leave New Zealand’s shores, had been born in Britain or elsewhere in the British Empire. Of the 145,624 men examined by the New Zealand military authorities between 1916 and 1918, 20,635 had been born in England, 8274 in Australia, 6279 in Scotland, and 1097 in other British possessions, not to mention continental Europe, the USA and elsewhere. In 1935 the Defence Department calculated that 866 of the NZEF’s war dead – 4.8% of the total – had been born in Scotland, and the proportion born in England must have been considerably greater. The NZEF was organised by the New Zealand authorities and funded by the New Zealand public, but it was made up of men from across the empire. The bottom line is that it was impossible to even estimate the total number of New Zealand-born personnel who served in other units, and, short of the compilation of a database of personal details of every Allied serviceman, this task is likely to remain impossible. The Defence Department’s practice of adding the 1184 and 3370 ‘known’ personnel to the NZEF total, therefore, skews the picture both of New Zealand’s service record and of the records of the imperial units in which they served (if all the unit numbers are combined to calculate total figures for all the British forces, these individuals are counted twice). We are therefore unable to add the numbers of New Zealand-born recruits serving in non-NZEF units to the NZEF figures to create ‘meta-New Zealand’ data on all Kiwis, everywhere. The few partial statistics available are too patchy and piecemeal to give us even an indication of how many New Zealanders served across all the British Empire's military forces. We therefore need to treat the few available (and very approximate) figures for New Zealanders serving in imperial units with caution. The soundest basis for calculating the total number of New Zealand service personnel, therefore, is to count only those who served in ‘New Zealand military forces’, and treat those in other units as a separate category. How many men and women served in the NZEF? Turning to the NZEF itself, it is once again necessary to define what we mean by ‘service’. The Defence Department considered men who had served in a war zone or in a staging area overseas, or were aboard a troopship on their way to war on the day the Armistice was signed, to have been ‘on active service’, and we follow that practice. Those who had enlisted but were still training in New Zealand were excluded from the ‘active service’ total. Provision and maintenance considered that, on this definition, 99,260 individuals had been on active service – 92,860 in the main NZEF and 6400 in the smaller New Zealand units. Of this number, 550 were nurses. The Defence Department reduced the active service total to 98,950 in January 1920, though its clerks sometimes gave out the number 99,500 in the early 1920s. The lower figure was included in Studholme’s Record of personal services during the War in 1928, and remains the most authoritative figure available from the documentary sources. How many New Zealand servicemen volunteered, and how many were conscripted? From August 1914 until September 1916, all NZEF recruits were volunteers. For the rest of the war men were ‘called up’ for military service under a ballot system, but volunteers continued to be accepted. To judge the proportions that were volunteers or conscripts, we must first calculate how many there were in each group. The Defence Department produced several conflicting figures for the total number of men called up under the conscription system between 1916 and 1918, but the most reliable appears to be 138,034. The Government Statistician’s figures from November 1919 record that 134,393 men were called up under the monthly ballot system between November 1916 and October 1918 (s. 10 of the Military Service Act). An additional 2876 men were called up under s. 34 of the Act, the so-called ‘family shirker clause’, by which the Defence Department could call up the sons of families in which no-one had volunteered. It also called up 213 men under s. 35 of the Act, by which men found not to have enrolled for the conscription ballot could be sent straight to camp without being balloted. Some men were granted exemptions, while a large proportion of other men were rejected as medically unfit, both at the point of enlistment and after they had entered camp. The accompanying table illustrates this process. Of the 138,034 men called up under the conscription system, only 19,548 ultimately left New Zealand for service abroad. Of the 98,850 New Zealand personnel who served abroad, therefore, 79,302 (80%) did so as volunteers and 19,548 (20%) as conscripts. How many Māori and Pasifika soldiers served? In late 1914 the New Zealand government formed an ad hoc infantry unit called ‘The Maori (Native) Contingent’ composed of 500 Māori volunteers. It was reorganised in early 1916 as the ‘New Zealand Pioneer Battalion’, a combined Māori and Pākehā unit, and then again in September 1917 as an all-Māori (and Pasifika) unit, the ‘New Zealand Maori (Pioneer) Battalion’. Māori and possibly some Pasifika served in other NZEF and imperial units, but no data is available. 550 nurses served in New Zealand units during the First World War. Some New Zealand women served in other imperial nursing units. How many people ‘served’ in New Zealand itself? The Defence Department managed two branches of military service within New Zealand during the First World War: the Home Service Branch and the Territorial Force. Home Service men and Territorials are distinct and separate groups from the NZEF serving overseas, and should be treated as a separate category of military service. What proportion of the New Zealand population served in the NZEF? Calculating the proportion of New Zealanders who served in the NZEF depends, as with much else, on who you include and which figures you select. Provision and maintenance (Graph 1) plots embarkation figures as a percentage of the total population, and concludes that 9.2% of the population embarked on active service. The cited population figure – 1,089,825 – is the government statistician’s estimate for 31 March 1914, while the active service figure – 100,444 – includes the naval and aviation recruits who left New Zealand for service in British forces. If you use the figure of 98,950, then 9.1% of the population left New Zealand on active service. How big a part of the overall British military forces did the NZEF make up? How many men refused to serve in the NZEF? The Military Service Act 1916 required all men aged between 20 and 45 to register with the Defence Department, which made them liable to be called up in a conscription ballot. Eligible men could be exempted because of ill health, because they worked in an essential industry, or on a few other specific grounds; all others were legally obliged to serve in the NZEF. Provision and maintenance tells us that there were some 58,000 New Zealand ‘casualties’ of the First World War, out of around 98,000 servicemen, of whom around 16,000 died and 41,000 were ‘wounded’. These straightforward-seeming figures, however, should be treated with great caution. A ‘casualty’, from the NZEF’s point of view, was a person who had been removed from active service for some period of time and so was unavailable for service at the front. Its casualty lists therefore record not only those who had died or were being treated for illness or injury, but also those who were missing at the time the list was made, or had been taken prisoner by the enemy. The ‘wounded’ list, furthermore, counts instances of men being hospitalised for any reason, rather than just those ‘wounded’ on the battlefield. Therefore a man who was hospitalised for toothache or back pain on five occasions was potentially counted five times as ‘wounded’, and might appear again in the overall casualty total if he died while in uniform. This section reviews methods of calculating New Zealand’s First World War fatalities and the more complicated question of counting the ‘wounded’. How many New Zealand service personnel died during the First World War? There are several ways to calculate the number of service personnel who died during the war. The New Zealand government, however, subsequently changed the basis for its official roll of honour. It now follows the practice of the Commonwealth War Graves Commission (CWGC) in limiting its scope to ex-service personnel who died between 4 August 1914 and 31 August 1921 (many New Zealand ex-servicemen died of war-related causes after that date, but they are not counted among the country’s official war dead). In 1963–4 the Defence Department compiled a new roll of honour to be housed in the Hall of Memories at the National War Memorial. This appears to have been based on the names listed in the 1924 Roll of honour, minus the post-August 1921 names and with a few other minor revisions. The official tally of war deaths was now 18,052. The roll of honour remains open to revision, and recently six individuals who died in the war’s early weeks or committed suicide shortly after its conclusion have been added, bringing the official total to 18,058. Taking the number of personnel as 98,950, and the 16,697 who died between 1914 and 1918 as the most historically (rather than administratively) meaningful figure, then 16.9% of them died during the war. How many nurses died during the First World War? Twelve nurses died during the war, including 10 who drowned because of the sinking of the Marquette in 1915. These deaths are included in the total death figures discussed above. Calculating death figures for any campaign or battle is a complex and sometimes fraught exercise, and the figures tend to be only as good as the most recent in-depth research into them. The source material is often patchy and inconsistent, and needs searching interrogation to be properly understood. Collecting data on the battlefield was a piecemeal and difficult process, and casualties were sometimes reported a week or more after the fighting had taken place. Men reported as missing or captured were later located or reclassified as dead, further complicating the collection of accurate data. Identifying the number who perished on the Somme, say, will depend both on the accuracy of the figures collected at the time and the dates at which you start and stop counting. Many of the men who died in the weeks following the New Zealand Division’s withdrawal from the front lines succumbed to wounds sustained in the field. Others died months and even years later, and attributing each death to a specific battle or phase of combat would be a major exercise in statistical forensics. These complexities make it necessary to set some limits on the span of a specific campaign or battle. The figures for the Gallipoli campaign and the three major Western Front offensives involving New Zealand forces listed below are based on (a) estimates by the official medical historian Lieutenant-Colonel A.D. Carbery in 1921 derived from official casualty returns, (b) later revisions of those figures by subject experts, and (c) death statistics gleaned from the Commonwealth War Graves Commission database. How many New Zealanders died during the Gallipoli campaign? How many New Zealanders died during the Somme offensive? How many New Zealanders died during the Messines offensive? Carbery estimated that there were 3633 casualties at Messines between 7 and 13 June 1917, including 473 killed, 2726 wounded and 434 missing (he went beyond the NZEF’s departure from the lines on 9/10 June in order to include late casualty reports). Many of the missing would later be counted among the dead. The Commonwealth War Graves Commission database lists the deaths of 727 New Zealand service personnel in Belgium between those dates, and 110 in France between 8 June – when wounded men were first evacuated there – and 13 June. This total of 837 will include a few men who died of illness and from injuries unrelated to the Messines offensive. The Messines data awaits in-depth analysis and refinement. How many New Zealanders died during the Third Battle of Ypres (Broodseinde and Passchendaele)? How many New Zealanders died in each theatre of war? The Roll of honour (1924) assigns the 16,697 deaths on active service between August 1914 and November 1918 to four theatres of war plus ‘United Kingdom and other places and at sea’. Gallipoli claimed 2721 lives (16.3%), while 12,483 (74.8%) died in France and Belgium, 381 (2.3%) in Palestine, 259 (1.6%) in Egypt and 853 (5.1%) in the United Kingdom and other places. How many NZEF service personnel were executed? How many New Zealanders died while serving in other British Empire and Allied forces? As noted above, New Zealanders serving in other British Empire and Allied forces should be counted separately from the NZEF on the rare occasions when figures are available. The only New Zealanders serving in imperial military forces who are now counted in the New Zealand roll of honour at the National War Memorial are 20 men who died while serving in the ‘New Zealand Division of the Royal Navy’. This unit was created shortly before the war as an administrative division of the Royal Navy’s China Station that would oversee Royal Navy activity around the New Zealand coast. These names are of men who served on HMS Philomel and Torch, naval vessels funded by the New Zealand government but under the control of the Royal Navy. They are not included in the published 1924 Roll of honour, which lists only men who served in the NZEF, but were added to the National War Memorial roll of honour in 1963–4, apparently as a way to retrospectively insert a New Zealand naval presence into the First World War roll. The CWGC database lists these men as members of a number of different – and mostly non-existent – naval forces. This probably reflects the relatively obscure administrative status of the ‘New Zealand Division of the Royal Navy’ within the Admiralty itself, never mind for the public at large, even at the time. Researcher Errol W. Martyn has traced the history of New Zealanders who served in the various imperial and dominion air forces during the First World War. Martyn records that ‘over 70’ such New Zealand personnel lost their lives between 1915 and 1918 (Martyn, For your tomorrow: volume 1, 1915–1942, p. 37). How many NZEF personnel were wounded? As noted above, the Defence Department’s ‘casualty’ lists provide periodic tallies of those treated for wounds, illness and injury during the war, counting all those removed from the front line for medical treatment (though not necessarily for a long period of time). Total figures for ‘wounded men’, therefore, need to be treated with caution, because they count the number of times a person was admitted to hospital for any reason rather than the number of ‘wounded men’ per se. Provision and maintenance lists 41,262 ‘wounded’ in its casualty statistics for August 1914 to November 1918; the department increased this figure to 41,317 in January 1920. For the reasons described above, these figures, in aggregate form, provide no meaningful information about the number or severity of war-related injuries or illnesses sustained by New Zealanders. Figures for ‘wounded’ men are most meaningful in the context of specific campaigns and offensives, where they demonstrate the impact of those phases of combat on the forces involved. How many New Zealanders were taken prisoner? The number of men who enlisted for Home Service in New Zealand in 1917 and 1918. They served in a variety of civilian roles in the training camps, coastal forts, Defence offices and elsewhere. The revised Defence Department figure for NZEF personnel despatched from New Zealand between 1914 and 1918, and considered to have been ‘on active service’. The Defence Department’s Provision and maintenance figure for total NZEF personnel despatched from New Zealand between 1914 and 1918, and considered to have been ‘on active service’ – superseded in 1920 by a revised figure, 98,950. Provision and maintenance figure for all NZEF personnel despatched from New Zealand between 1914 and 1918 (99,260), plus 1184 ‘miscellaneous’ personnel mainly shipped from New Zealand to Britain to join imperial units, who should properly be counted as part of those units rather than the NZEF. Provision and maintenance figure for all NZEF personnel despatched from New Zealand between 1914 and 1918 (99,260), plus ‘miscellaneous’ personnel mainly shipped from New Zealand to Britain to join imperial units (1184), plus the troops in New Zealand training camps at the time of the Armistice (9924). Provision and maintenance figure for total men called up and sent into camp (‘mobilised’) between 1914 and 1918, including men who died in camp or were discharged before the end of training. Provision and maintenance does not explain how this figure relates to its figures of 99,260, 100,444 or 110,368. Provision and maintenance figure for total men called up and sent into camp between 1914 and 1918 (117,175, including men who died in camp or were discharged for any reason before the end of training), plus men involved in home service (7036). Provision and maintenance disaggregates this into 91,941 volunteers and 32,270 conscripts, without explaining where the Home Service men fit in. This figure is sometimes cited as the number of people ‘mobilised’, a misleading description. A significant proportion of this group never saw active service. The Defence Department figure from January 1920 submitted to the British publication Statistics of the military effort of the British Empire during the Great War 1914–1920 (p. 771). This includes the 124,211 described above, plus 944 men sent from New Zealand to join imperial units and 3370 who were ‘known to have left New Zealand to join British and Imperial forces.’ This is the least defensible of all the department’s figures. Provision and maintenance figure for NZEF personnel who died between 5 August 1914 and 12 November 1918 (excluding those who died in camp in New Zealand) – superseded by the January 1920 figure, 16,697. The Defence Department’s revised 1920 figure for NZEF personnel who died between 5 August 1914 and 12 November 1918 (excluding those who died in camp in New Zealand). The current official First World War New Zealand roll of honour figure, comprising 18,052 personnel who died during the war and up to 31 August 1921, both overseas and at home, and six individuals added retrospectively. The 1924 Roll of honour figure, which includes those killed in action before 12 November 1918, NZEF personnel who died between that date and 31 December 1923, discharged NZEF personnel who died up to 31 December 1923, and recruits who died while training in New Zealand between 1914 and 1918. An oft-quoted figure for total New Zealand deaths, probably first published in A.H. McLintock’s Encyclopaedia of New Zealand (1966). No statistical foundation can be traced for this figure, but it may be an attempt to add deaths in other forces to the NZEF figure. The Provision and maintenance total of the monthly tallies of people killed (16,302), ‘wounded’ (41,262), missing (84) and taken prisoner (356) between August 1914 and November 1918, minus those counted in error and subsequently accounted for. Individuals appear multiple times in the list, which should be read as the total incidence of death, hospitalisation, going missing, and being taken prisoner rather than as a total of individual people. Superseded by a figure of 58,014 in January 1920. The Defence Department’s 1920 revision of the Provision and maintenance casualty figure of 58,004. Published in February 1919, Provision and maintenance is the most detailed statistical overview of the military side of New Zealand’s First World War experience which has ever been published. It provides a snapshot of the Defence Department’s knowledge at the end of the war, although some of the figures would be revised over the next few years. The official New Zealand Roll of honour was published in 1924, once the final casualty lists had been compiled and the Defence Department records updated. Copies were supplied to foreign governments and distributed to New Zealand politicians and military figures, but most of the print run of 1000 was offered for sale to the public. The Roll of honour remains the foundation of our knowledge of New Zealand’s war dead, though individuals can now be looked up on the Commonwealth War Graves Commission database http://www.cwgc.org/ and Auckland Museum’s Cenotaph database http://www.aucklandmuseum.com/war-memorial/online-cenotaph. Lieutenant-Colonel John Studholme compiled his Record of personal services in the years following the war, as a companion volume to the four official war histories published by the government from 1919. He described the book as ‘unofficial, but based on official records’, but its endorsement by the Defence Department and publication by the Government Printer suggests it was official in all but name. The bulk of the book documents the careers of individual officers and the honours awarded to New Zealand personnel, but it also includes much useful information about how the NZEF operated. John Studholme (1863–1934) was a landowner who commanded the Ashburton and South Canterbury Mounted Rifles before the war. He was promoted to major and temporary officer commanding the Canterbury Mounted Rifles at Gallipoli in May 1915, and served as Assistant Adjutant-General to the NZEF from 1917 until 1919. This list of troop transports, along with the number of men and horses aboard and the dates of departure and disembarkation, appeared in a report prepared by the Defence Department’s Director of Movements and Quartering in August 1919. The most detailed known list, it records troopships carrying men of the NZEF to Egypt and Western Europe, hospital ships, and vessels returning men to New Zealand. It does not include troop movements to or from Samoa after the Advance Party. These lists complement the official embarkation lists, on which the names of every individual aboard each ship appear. A selection of troopship magazines can be read here: http://muse.aucklandmuseum.com/databases/LibraryCatalogue/SearchResults.aspx?Page=1&c_keyword_search=troopship+magazine&c_subject_search=world+war+1914-1918. Director of Recruiting D. Cossgrove wrote this assessment of recruiting under conscription in March 1919. It includes a detailed overview of how the scheme operated, recruiting circulars explaining the day-to-day workings of the system, and some useful statistics. Drawn by the Defence Department’s Base Records Branch in 1919. Government Statistician Malcolm Fraser compiled this potted history of the wartime conscription process from the perspective of those responsible for administering it. It provides many useful clues to how the process was undertaken, and is a useful counterpoint to the Defence Department perspective provided by the Cossgrove report. It includes a table of figures outlining the number of men called up in each ballot, though it omits the men called up in the 23rd ballot in October 1918. New Zealand official year-book, 1919, pp. 255–6. Evening Post, 13 February 1919, p. 7. Dominion, 14 February 1919, p. 6. See correspondence in AD1 894 39/235 pt 2, Archives NZ. H. Turner, Under-Secretary of Defence, to J. Hand, 31 May 1935, AD1 894 39/235 pt 2, Archives NZ. D. Cossgrove, ‘Recruiting 1916–18’, appendices 3(4) and 12, AD1 712 9/169 pt 2, Archives NZ. ‘Roll of Honour, Men born in Scotland who served with NZ Expeditionary Force’, in AD1 1254 276/1/2, Archives NZ. Provision and maintenance, pp. 43, 45–7. Provision and maintenance, table X, records the ‘number of troops provided by New Zealand from Outbreak of War to 12th November, 1918’ – including troops who never reached the front. These are distinguished from men ‘in training in New Zealand on 12th November 1918’ (table XVIII). D. Cossgrove, ‘Recruiting 1916–18’, appendices 2 and 3, AD1 712 9/169 pt 2, Archives NZ. Provision and maintenance, p. 47. J. Allen to H. Creedy, 5 November 1920, and elsewhere in AD1 894 39/235 pt 2, Archives NZ. D. Cossgrove, ‘Recruiting 1916–18’, appendices 4, 5, 6(1), and 9, AD1 712 9/169 pt 2, Archives NZ; Provision and maintenance, p. 47. Provision and maintenance, pp. 45, 50. Provision and maintenance, p. 41. D. Cossgrove, ‘Recruiting 1916–18’, appendix 9, AD1 712 9/169 pt 2, Archives NZ; Baker, King and country call, p. 220. Provision and maintenance, p. 44. Provision and maintenance, p. 48. Provision and maintenance, Graph 1; for population total see Government Statistician to Chief of the General Staff, 27 July 1917, AD1 893 39/235 pt 1, Archives NZ. This total is markedly lower than the official population estimate for 31 December 1914, 1,158,436, published in the 1915 Official year-book (p. 95), and the 1916 census figure of 1,142,115 (including 42,666 soldiers serving overseas) (Census, 1916, pp. 12, 15). Statistics of the military effort of the British Empire during the Great War, 1914–20, pp. 62–3. Provision and maintenance, p. 49. Baker, King and country call, pp. 174–8, 243. [25b] Paul Baker, ‘New Zealanders, the Great War, and Conscription’, Phd thesis, University Auckland, 1986, p.386. ‘Return of cases dealt with under the Military Service Act to 31 March 1919’, AD1 1039 64/28, Archives NZ. Baker, King and country call, p. 204. Provision and maintenance, p. 50. Roll of honour, p. xviii; Studholme, Record of personal services during the War, p. 383. Roll of honour, p. xvii. See correspondence in IA1 W2042 26 174/15/14 pt 1, Archives NZ. Roll of honour, p. xviii. Chris Pugsley’s history of the campaign adopts these figures (Gallipoli: the New Zealand story, revised edn, Auckland, 2014, p. 366). A.D. Carbery to G.O.C. Administration, 11 March 1921, AD1 894 39/235 pt 2, Archives NZ. Macdonald, On my way to the Somme, pp. 229, 245. Andrew Macdonald personal communication with Tim Shoebridge, 7 March 2015. A.D. Carbery to G.O.C. Administration, 11 March 1921, AD1 894 39/235 pt 2, Archives NZ; repeated in his The New Zealand medical service in the Great War 1914–1918, p. 315. A.D. Carbery to G.O.C. Administration, 11 March 1921, AD1 894 39/235 pt 2, Archives NZ; repeated in his The New Zealand medical service in the Great War 1914–1918, p. 356. Macdonald, Passchendaele: the anatomy of a tragedy, pp. 240–5. Andrew Macdonald (Passchendaele: the anatomy of a tragedy, p. 243) puts the precise figure at 845, while Glyn Harper (Dark Journey, p. 90) has 846. More recently, Ian McGibbon has made the case for it being 843. Pugsley, On the fringe of Hell, p. 7 and passim. Provision and maintenance, p. 50; Statistics of the military effort of the British Empire during the Great War, 1914–20, p. 771; this figure was subsequently republished in Studholme, Record of personal services during the War, p. 383. Provision and maintenance, p. 51. Statistics of the military effort of the British Empire during the Great War, 1914–20, p. 771. Studholme, Record of personal services during the War, p. 384. Historian David Filer put the figure at 506, adding five to the total Gallipoli/Egypt deaths counted by Studholme, in his entry on prisoners of war in Ian McGibbon (ed. ), The Oxford companion to New Zealand military history, Auckland, 2000, p. 430. We have 23 biographies, 40 articles, related to First World War by the numbers.